Join Neil Hurst in his 10th consecutive panto at the Victoria Theatre as Snow White tangles with the Wicked Queen and everyone has a good sing song. Snow White is the fairest pantomime of them all - a magical fairytale peppered with fun. After the magic mirror declares Snow White to be the fairest in all the land the Wicked Witch (played by Felicity Skiera) erupts in a jealous rage determined to finish off Snow White and restore her position as the most beautiful. But will Snow White’s friends be able to save her from the clutches of the demonic queen so that everyone will live happily ever after? Once again Imagine Theatre, producers of this pantomime comes up with all the ingredients for a perfect family show with a dastardly villain, a hapless comedian and an hilarious pantomime dame. And all bound together by spectacular sets and costumes, lots of singalonga songs, dances and bags upon bags of slapstick fun and tomfoolery. Neil Hirst plays Jingles the Jester, Jolyon Dixon is Dame Dolly Mixture; Jess Pritchard is Snow White and Sam Willison is Prince Michael. 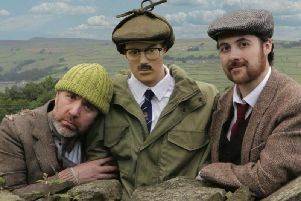 Tickets: Go to www.victoriatheatre.co.uk or call the box office on 01422 351158.
lSee page 24 for some special 2-4-1 ticket offers.